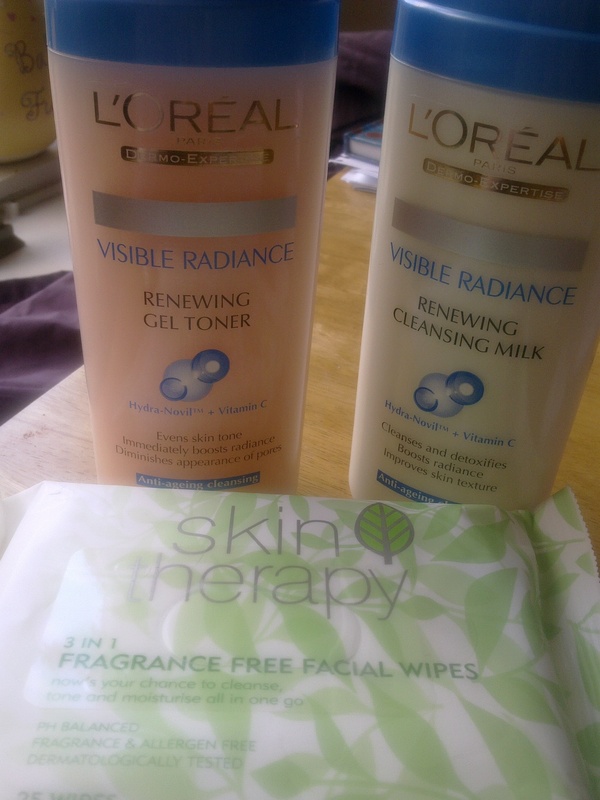 The Skin Therapy wipes were from Wilkinson and cost a fantastic 57p! I also bought a cleanser and a toner from Loreal. I still miss Loreal’s Visible Results face wash (bring it back, Loreal!!) so as these were only £2.50 each I thought I’d give them a go. Obviously there are cheaper cleansers and toners out there (check out Boots, Superdrug and Tesco for budget version) but they are only a bargain if you get on with them! Anyway, with the new stuff it is a case of so far so good. The same day I bought the above I also went to Boots to replace my foundation using my Advantage card points (ah, I love free stuff, don’t you?) and had a look at the Loreal display. The cleansers and toners ranged from £4.69 to £5.89 so I think £2.50 is an amazing bargain! Ideally I wouldn’t have bought any of this this month. However, we don’t go to the ‘smoke’ that often and since we were going anyway (for a birthday party) it seemed daft not to make the most of the petrol used and have a quick scout around. Annoyingly, none of my local shops sell the colour foundation I use. I always need the palest one in any range and I have to wait until I go to a big town to get it. I was literally down to crumbs in my compact so I was relieved to get my new, free one! 100,000 thanks to my readers! After writing my Bank Holiday post this evening I was tooting about and discovered that I have had over 100,000 hits on my blog! Wow! I’m far from having one of what I call the ‘mega’ blogs but I’m pretty bowled over that so many people have dropped by since Shoestring Alley started on 2009. To every person that has stopped by – thank you!! And also…who are you?! Even though I seem to have a steady stream of readers each day I only ‘know’ maybe a dozen of you, made up of my regular commenters and fellow bloggers. It would be lovely if you could stop to say hello and maybe tell me what you like reading best, what you might like to read more about and so on. I also wanted to say that there are a few new bloggers on the PF block and you’ve been kind enough to leave me messages here and add me to your blogrolls. I’ve been crazy busy for the last couple of months and might not have managed to add everyone to my own blogroll or leave any comments for you, even though I’ve managed to read a few here and there. Things should ease up once the house is finished (so close!). If anyone would like me to add them to my blogroll (or do blogroll swapsies) then leave a comment here and I’ll sort it out ASAP! …which was just gorgeous. I didn’t get out on the waves at all last year (what with being heavily pregnant and having a baby!) so it was lovely to get out today. 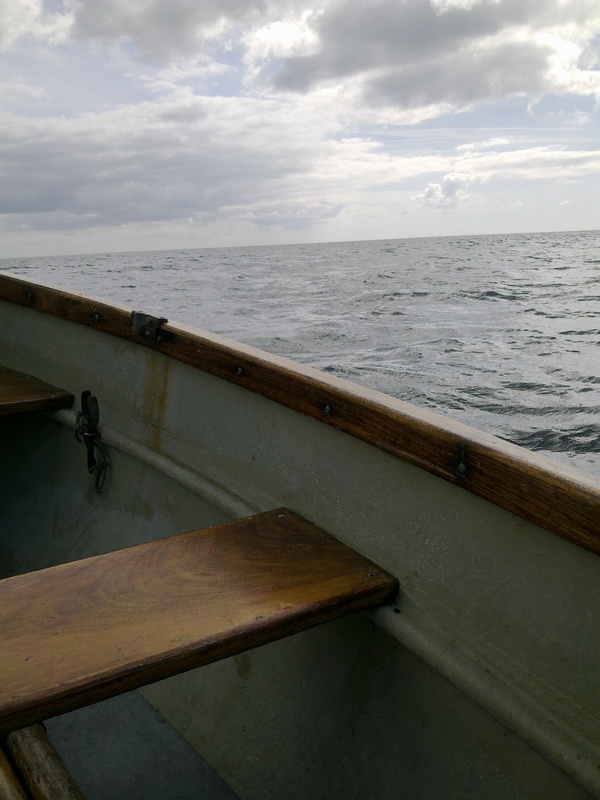 It was also great to be able to enjoy the coastline without the bank holiday madding crowds! I’d feel sad about going back to normal except we’re going away in less than two weeks! Yay!! I found them for £5 when I was in Waitrose looking for posh chocolates to give as a birthday present. Even though I’m not short on birthday cards at the moment there will always be more birthdays and I thought they were gorgeous. There are 6 cards in the pack so they work out to be 83p per card – waaaaay cheaper than anything you’d find in most shops when buying individually. 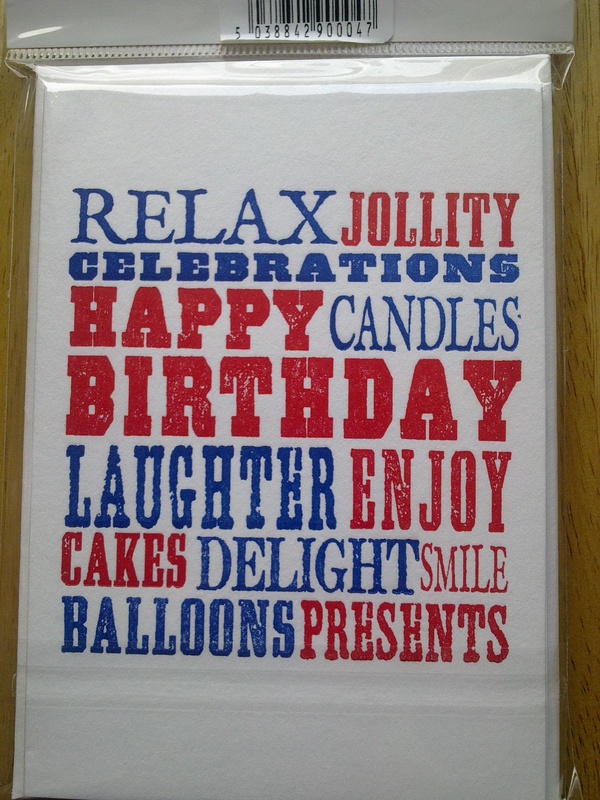 I love this letterpress style and have seen similar cards sold individually for much more in Paperchase. Good buy!! My birthday card box had a sudden influx last month as we abandoned a project for our hallway. I was going to paint some old frames and pop greetings cards inside them (much cheaper than buying prints) but we’ve decided against it. Plus I found an original watercolour painting in a second hand shop for £8 that will fill the space instead. 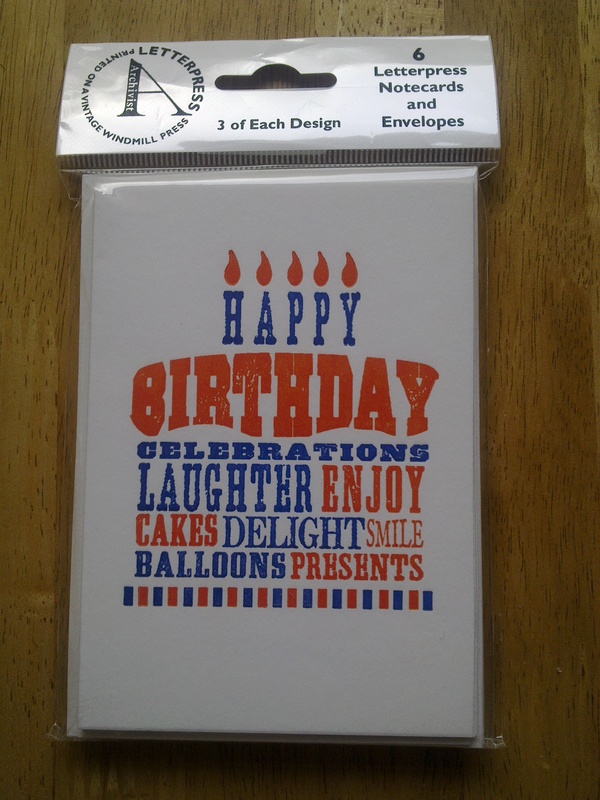 I’d already bought the cards but they won’t go to waste – they’re in my card box ready to go! I love making soup – such a great way of using up odds and ends of veg so they don’t go to waste, plus so nutritious compared to a sandwich! However, my results are sometimes mixed when I (as I often do) take the throw-it-all-in-a-pot-and-see-what-happens appproach. This week I had a real jumble of veg to hand (due to the demeted shop last week). Into the pot went: olive oil, an onion, the end of a courgette (from when I made the tomato, courgette and basil pasta sauce), a leek, 2 carrots, nearly a whole pack of celery, half of a large sweet potato (from when I made the casserole), 3 small, bendy parsnips, some dried mixed herbs and a couple of stock cubes. There might have been other things in there too that I am forgetting. Basically I kept rooting through the fridge, finding things that needed to be used, chopping them up and throwing them in. I was a bit suspicious about this particular batch – I couldn’t imagine it tasting particularly nice but since I’d gone over budget there was no way I was going to chuck the food out! Plus I really needed a soup for my lunches as we were nearly out of salad stuff. The end result was gorgeous. I love little moments of cooking serendipity like that. I doubt I could ever exactly recreate the soup again but I guess that’s the whole point. Thus it has been christened ‘Serendipity soup’. I anticipate there being a wide variety of serendipity soups being produced on my hob this winter as I make the most of a very cheap, nutritious way of having lunches and try not to let anything go in the bin. I use various methods for making soup depending on the recipe. However, when I’m freestyling I tend to fry up on onion with a squidge of garlic puree and bit of olive oil until the onion turns golden. I give the onion a quick stir now and then while it is frying and use the rest of the time to start chopping, adding veg as I go along. Then I quickly make up some stock (generally using stock cubes or powder) and add enough to that the veg is almost covered, sprinkle on some dried, mixed herbs, pop the lid on and cook until the veg is cooked. Once cooled I give it a blitz with my hand held blender and tuck potions away in the freezer. (Note: you can add salt and pepper. I don’t like pepper so I don’t use it and I tend to find that the stock cubes add enough salt for me. It’s a personal taste thing though!). We’re just coming up to the time of year when soups and casseroles will be taking the place of salads. As I type the rain is hammering down and it is so dark it might as well be evening. I’ll be having a bowl of serendipity for lunch and hoping for a few more sunny afternoons before I have pack my sleeveless tops away and find my boots! I got paid less than a week ago and already it has all just about gone (and then some). We’re right down to pennies in most of our accounts. This is simply because we’ve spent a lot in the last couple of weeks! I’ve already blogged about the stuff we bought for the house but I also stocked up on loads of stuff for Baby as Boots are currently running their 3 for 2 mix and match promotion in their baby department and it would have been stupid not to make the most of it. I ordered some clothes from Next (all very much needed plus a £10 scarf as a treat) and I am going to be writing a very annoying cheque for the incomptenent morons at HM Revenue & Customs who keep cocking up my tax codes. We’ve got our holiday coming up (3 nights in Cornwall with some friends and their little ones) which I am really looking forward to. I haven’t been away for almost exactly two years (I was 6 weeks pregnant at the time – a lot has changed since then!). Fortunately, Husband and I have been really organised about saving for the holiday so not only is it all paid for but we worked out how much we’d need for petrol and spending money and saved it up. Now our only task is not spending any of it before we go! Do you get sucked into buying magazines for the free gifts? I only do this very, very rarely because the giveaways are usually crap but just occasionally they are worth it. Last year Glamour magazine did a fantastic giveaway, with full sized versions of Benefit make-up pencils. I got one on the way into hosptial the day Baby was born. It might seem an odd time to have been popping to the shops but since I was going in to be induced we were advised to bring snacks and something to read! (What you might find odder is that the book I chose to take with me was the Diary of Anne Frank. I digress). Anyway, I bought a copy of Glamour because it had a free Eyebright pencil worth £14. Two weeks after Baby was born I made Husband drive me to every corner shop in town (I couldn’t drive because of the caesarian) until I tracked down copies of the same magazine with the BadGal pencil and the concealer stick. It was worth it. They are totally brilliant and I got £42 worth of make-up for £6! 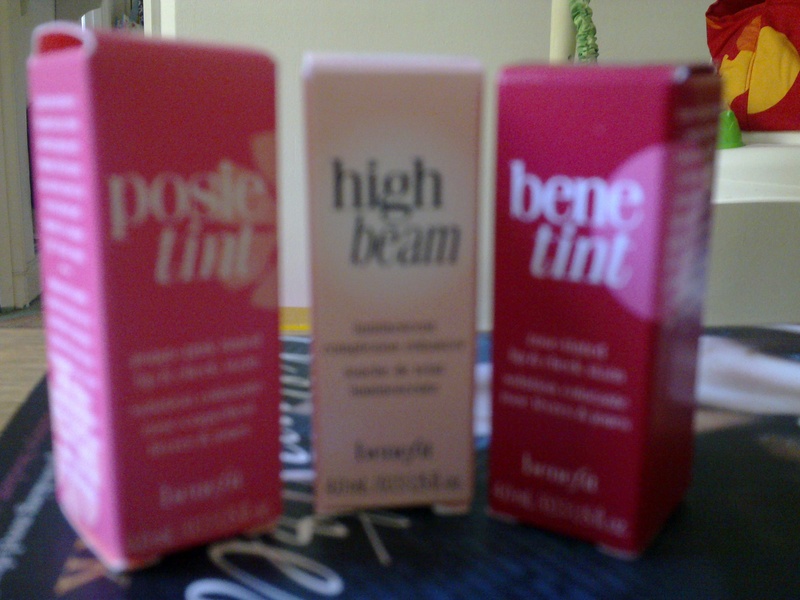 I didn’t think they could top it but, one year later, Glamour magazine teamed up with Benefit once more and lured me in with the mini sized versions of their lip and cheek tints and also Highbeam which I’ve wanted to try out for ages. Excuse the fuzzy photo – my camera phone doesn’t like doing close-ups! I’ve been using these loads and there is still plenty left – they’ll last me ages. More recently I bought Red magazine (which is the one magazine I buy every month) and got a lovely shower gel which has gone into my stash to save me having to spend any cash next time I run out. I mention the above because I think these seriously great freebies are the exception to the rule and I don’t generally buy a magazine just for the free gift. Do you? What’s the best/worst thing you’ve ever had free with a magazine? Make your own personalised ‘art’! You might remember that I was excited a couple of months ago as I found some wrapping paper that I thought I could frame and hang as a print in our bedroom. Annoyingly, when I got home I realised that the pattern went ‘up’ instead of ‘across’ and it wouldn’t work. Instead I decided to decorate some ‘old-school’ luggage tags that I bought a long time ago with a similar project in mind. We already had a frame with a mount that we bought in IKEA years ago. It has displayed several different prints in several locations around our home over the last few years. It was just the right size to display 8 of these tags. 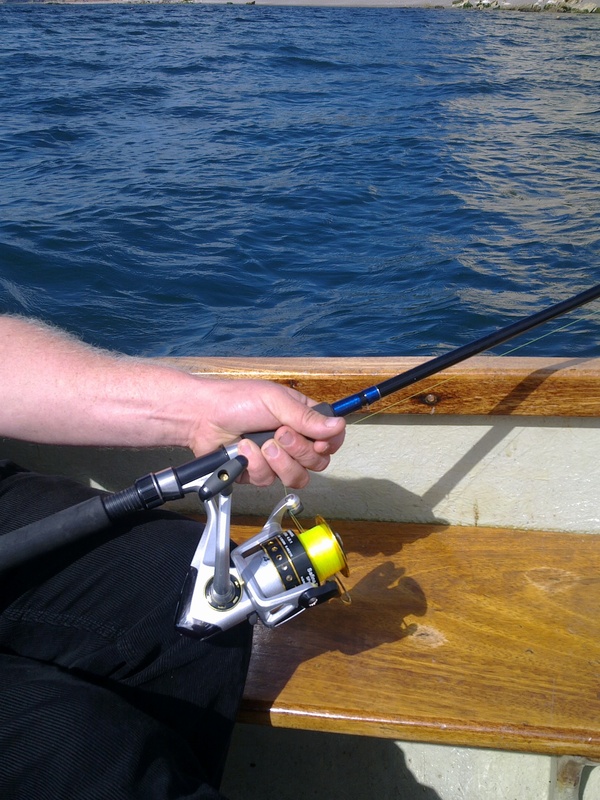 You don’t have to be able to draw or paint to create something personalised. 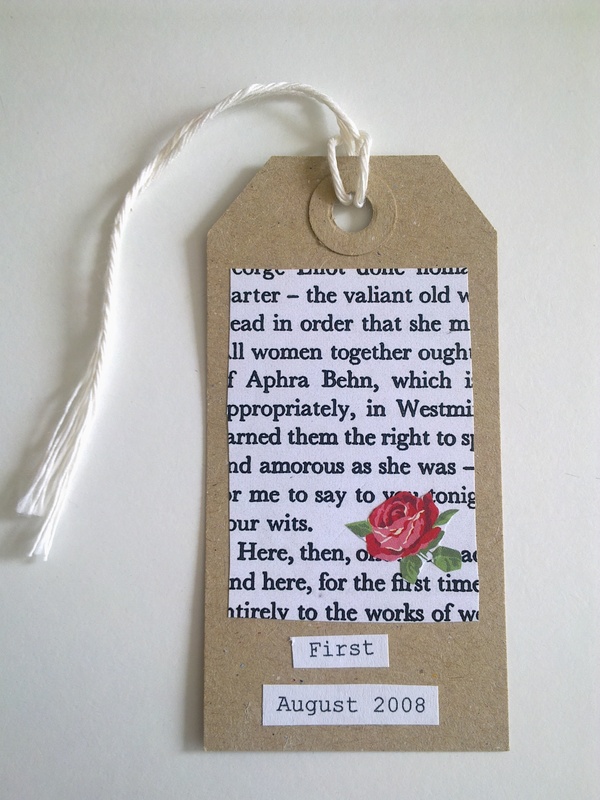 I decorated the 8 tags in lots of different ways including a scanned copy of a map showing our favourite holiday spot, pressed flowers from the garden of my childhood home and other bits and bobs that mean something to us. I bought a piece of pale grey card which I stuck the tags to (in two lines of four) and then popped it into the frame. The thing that took the most time was deciding what to put on each tag! Once I figured it out, I printed out any text required using a typewriter style font as I thought it fitted with the look of the old fashioned luggage tags. I then printed the document and cut out each word or phrase and stuck it on the corresponding tag. One of the great things about this is that none of it has to be perfectly neat or straight – a bit of wobble makes it look even better! Since I already had the frame, the tags, a printer, a sheet of A4 paper and some ink, the only thing I had to buy was the card which I bought for pence in a local stationery shop. Firstly, thank you to the lovely folk who left me messages following my midnight rant. They dispersed not long after doing a few rounds of the YMCA and all was quiet by about 12.30am. At precisely the moment my Husband started snoring. At 1.15am I asked if he’d mind going and sleeping on the sofa. I’ve got a tricky relationship with sleep. If I miss my ‘window’ I find it really hard to get to sleep and I missed so many windows last night that I was still checking my watch just after 2.30am. Not sure when I fell asleep but Baby woke up bang on 6am and not long after it was time to get up properly and get ready to go to work. Gah! I am seriously considering following Kat’s suggestion (see comments on last post) if it happens again! Speaking of, there is music blasting out from somewhere right now. On our road this is very, very unusual. Anyway. I was so tired after last night that when I woke up a huge coldsore had popped up. Thanks very much. Now I have to go and buy Compeed patches and get a repeat prescription for my Aciclovir tablets. So their party not only cost me a nights sleep but I also get to have a coldsore for at least a week and I get to pay out about £15 to take care of it. Grrrreat! Hilariously bad results. I am rebelling against myself. The more I try to diet, the more cake I eat. I ate 6 doughnuts on Friday (this is not a joke). Through trying to diet I have put on 5 pounds. I give up. Whatever, whatever, whatever! I’m not blogging about this again for a long time!! I hope you are all having a good week and some good sleep! It is almost midnight, I am exhausted and yet I am sat on my sofa typing this. Why? Because my f***ing neighbours are having a massive party and won’t shut the **** up. Who has a loud party on a Sunday night?! These people drive me insane. They have a ten foot wall around their property along with ten foot gates so you can’t go and knock at the door and ask them to turn the music down a bit. Their telephone number is not listed so I can’t give them a call. It took Baby over an hour to get to sleep because of the noise. Husband could sleep through a car crash and so now it is just me, sat here awake. I fell asleep on the sofa at 9pm, dragged myself through the motions of washing up, brushing my teeth etc but it wasn’t until Husband turned the TV off that I realised quite how loud it still was. 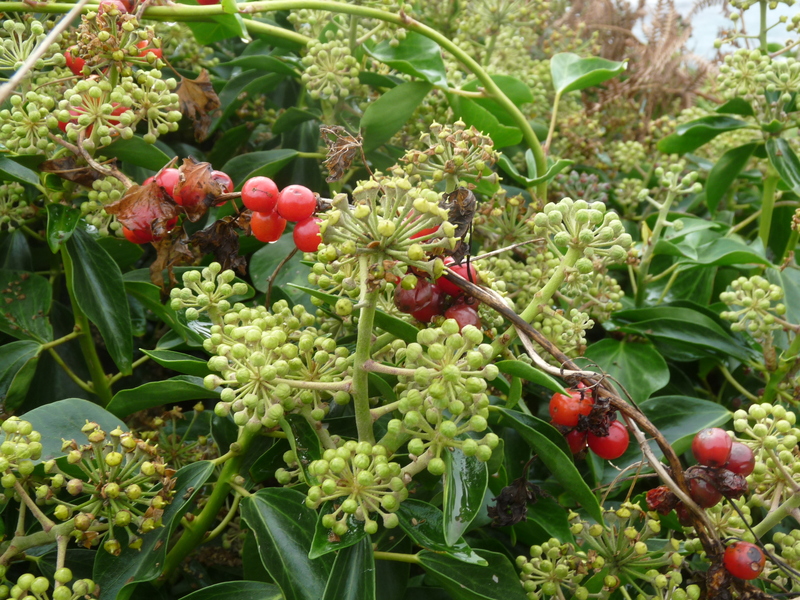 I phoned the police but they said there is nothing they can do – it is a case for environmental health. I phoned them but they said they won’t listen unless I give my name which I won’t because these particular neighbours are well known for being rich thugs. Plus I don’t want to have to put down that I had a dispute with my neighbours because that could lose us a house sale as you have to sign a document to that effect. So. I am listening to bunch of thick ****s cheering each other on as they splash around in their swimming pool while dancing and singing along to a peculiar medley of ‘New York, New York’ and ‘I Wanna Dance with Somebody’. That’s when I’m not listening to pissed teenagers running up and down the road shrieking and driving a car up and down (yes, almost certainly drunk). Apparently the police can’t do anything unless they actually catch one of them out on the road. No-one likes a party pooper I know (I never used to). But it’s a Sunday night for ****s sake! Husband and I both have to be up at 6am tomorrow and I’ve got a tiny little girl upstairs not getting a proper nights sleep all because some rich **** next door wants to show his big house and ****ing swimming pool.